Towards the end of the nineteenth century, Naples, the former capital of the Italian Mezzogiorno, was hit hard by a serious calamity: a cholera epidemic that had already long disappeared from the capitals of Europe. And by the turn of the twentieth century, Naples was struggling to keep up with the Industrial Revolution which would modernise the north of Italy, with the exception of the special law in 1904 for the industrialisation of Naples, which was drafted by Nitti at Giolitti’s request. Despite this, and with Naples having lost the privileges of being a capital city some forty years earlier, the long process of urban restoration saw the growth of the city’s bourgeois features, and the traits of the modern metropolis continued to grow. Naples had always excelled in the most diverse cultural fields: it had philosophers, scholars and jurists, but also engineers and architects, the canzone napoletana [Neapolitan song] as a cultural industry, department stores of a European standard, entrepreneurial initiatives and advanced social struggles. With the dawn of the new century, Naples was therefore still a great European capital, always at the forefront of high culture but also a pioneer of some of the new forms of mass culture. It was here, in the ancient metropolis at the heart of the Mediterranean, that the first expressions of a cultural industry which would more broadly establish itself over the course of the twentieth century were first developed. For instance, the system built around the establishment and worldwide diffusion of the canzone napoletana was a fully-fledged industry. But Naples was also the birthplace in Italy of the new art of cinema, which would then grow in the rest of the country. This was by all means the city’s belle époque, and not just because the Salone Margherita and Gran Caffè Gambrinus rivalled the major cafés chantants of Paris. For the most part, the city’s ruling classes had their dignity and also concerned themselves with public interests. The autumn of 1890 can be identified as the beginning of the belle époque in Naples. Amidst the works of urban improvement and renovation, the Galleria Umberto I was inaugurated: this would be the heart of the city’s renewed commercial and cultural life. Below this new and modern arcade – the brainchild of Neapolitan engineers Emmanuele Rocco and Paolo Boubée – the Salone Margherita, which the mayor himself, the prince of Torella, had wanted in this location, would open up for business and begin its successful activity. With a capacity of five hundred, it would quickly become the most important café chantant in Italy, in no way inferior to some of its Parisian counterparts such as the Moulin Rouge and the Folie Bergères. Just down the road, in between Piazza Plebiscito and Piazza San Ferdinando, the Gran Caffè reopened in the former Foresteria del Palazzo Reale, now the seat of the prefecture. It was entirely renovated and, upon its new owner’s decision, sported an addition to its name: Gambrinus, the name of the mythical king of Flanders and inventor of beer. Mariano Vacca, already owner of the nearby Caffè d’Europa on the corner of via Chiaia, entrusted the complete refurbishment of the new venue to renowned architect Antionio Curri, a famed professor of architecture at the University. Around forty artists, both sculptors and painters, brought to life to what Domenico Morelli defined “one of the most significant expressions of Neapolitan art of the nineteenth century”: a small-scale art gallery in the liberty and floral style featuring paintings by Pratella and Irolli, Casciaro and Caprile, Migliaro, Scopperra, and D’Agostino. But also the marbles of Jenny and Fiore, the bas-reliefs of Cepparule, the stuccos of Bocchette, the tapestries of Porcelli. The venue was a favourite haunt for the likes of Salvatore di Giacomo, Ferdinando Russo and Edoardo Scarfoglio, Matilde Serao and Roberto Bracco, Domenico Morelli and Eduardo Dalbono (popular Neapolitan poets and song writers, EDS) and Gabriele D’Annunzio (who between 1890 and 1892 lived his love story with Princess Maria Gravina Cruyllas di Ramacca in Naples). Here, outdoors, the great orchestras often carried out auditions for the Piedigrotta festival. In the evenings the Gambrinus was therefore frequented by a crowd of intellectuals and artists. 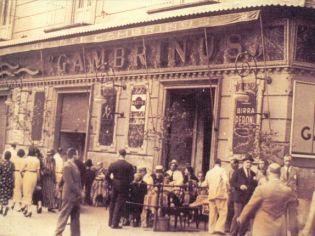 As the musical journal “La Tavola Rotonda” reported in 1891, after midnight the Gambrinus was invaded by aristocrats and ladies who flocked in from the theatres of the surrounding area: the San Carlo, the Mercadante, the Sannazzaro. As well as in many other cafés, particularly in the Salone Margherita, the chanteuses – who in Neapolitan became the sciantose – performed. These were Parisian vedettes such as Yvette Guilbert, Louise Weber (also immortalised by Toulouse Lautrec), Armand d’Ardy (‘A frangesa), the Belgian Cleo de Merode, the ‘romanziste’ with their classical repertoire, the ‘canzonettiste eccentriche’, eccentric singers, who would move swiftly from sentimental songs to brilliant pieces, the diseuses with their dazzling voices, and the wild gommeuses of the can-can. In the dazzling world of the cafès chantants, lit by the early electric lighting systems, song and dance were performed alongside theatre and a form of musical parody – a sort of comical-musical sketch – that in Naples went under the name of macchietta. Its greatest interpreter was Nicola Maldacea, and many of the scripts were written by the poet Ferdinando Russo. Also in Naples, the official journal of the Italian caffè-concertos, the “Café-Chantant”, was printed between 1900 and 1925. Starting in the 1890s, then, Naples was the Italian capital of the belle époque and the Salone Margherita was the most well-established Italian café chantant. But the Salone Margherita would also be central in the establishment of cinema screenings amongst the high classes of Naples. The Salone hosted the first Italian projection of a Lumière brothers film on 30 March 1896. The film, Levée de filet de pêche, with a bobbin only 17 metres long, shows a group of fishermen hauling in their nets from the sea in Via Caracciolo, seemingly in the vicinity of today’s Diaz roundabout. Also from 1896 are the moving pictures of Port et Vésuve and of some streets: Via Marina, Santa Lucia, Une rue (via Toledo). One year later, in 1897, a moving picture would also be made of the Salone Margherita itself. Since the beginning, the Tarantella is also present amongst the subjects of the Lumières’ ‘dal vero’ works (based on real, everyday life). Already in 1898, and for the first time in Italy, the Mele brothers’ department store Grandi Magazzini Italiani adopted the art of film for modern advertising purposes. In 1905 they would open up a cinema hall in the Galleria with screenings reserved exclusively for the clients of the Grandi Magazzini. But foreigners love the ‘picturesque’ of Naples. They are great consumers of the ‘stereotypes’ of the city and its people that have accumulated over the centuries. So in 1903, the American company Edison Manufacturing produced the documentary Eating Macaroni in the Streets of Naples, featuring men and boys lined up eating macaroni with their hands. A permanent hall exclusively dedicated to cinema was opened, also in the Galleria, in around 1897 by the entrepreneur Mario Recanati, from Padua, who had just returned from a stay in the United States. In the nineteenth century, a ‘travelling showman’, Menotti Cattaneo from Taranto, settled in Naples and opened up a wood shack in the Foria neighbourhood – followed by another between Porta Capuana and the train station – where film screenings were held, in particular in the form of the sceneggiata, a popular spectacle widely appreciated by the city’s working classes. From the middle of the first decade of the 1900s, cinema firmly established itself in the cultural tastes of Neapolitans, alongside the theatre and the caffè-concerto. By 1906, the development of cinema was impressive: in Naples alone, there were 27 active cinema halls. The newspapers speak of a ‘disease’, an ‘epidemic’, an ‘acute cinema fever’ that had taken over the city. The success of the Internazionale cinema in Piazza Carità was such that on its opening night, the police had to intervene to suppress the disorder caused by the great crowds pushing at the entrance. A month later, the newspapers announced that a ‘project for the expansion of piazza Carità was presented to the Consiglio Tecnico (the city council), with a view to improving the “comfort of the public that each evening mill around the square waiting to get into the Internazionale cinema, thus making circulation difficult”. Naples would also have a sort of monopoly of the film-related publishing industry. In 1908, seven cinema reviews were being published in Italy: of these, six were from Naples. The cinema, like the canzone napoletana, are both aspects of the cultural production in Naples, which was still alive and diverse before the Great War. The new technologies and in particular the advent of sound technology brought the historical phase in which cinema was made in Naples to an end. The references in the text are listed in the book, Napoli Belle Epoque, published by Editori Laterza (2015). Francesco Barbagallo is full Professor of Contemporary history at the Federico II University of Naples. Since 1983 he directs the journal “Studi Storici”. He published many volumes on the history of contemporary Italy and specifically on the Italian Mezzogiorno; essays on methodological issues, historiography, history of the Italian Communist Party and he also coordinated the realisation of History of Republican Italy (Turin 1994-1997). Among his publications are: L’Italia repubblicana. Dallo sviluppo alle mancate riforme. 1945-2008 (Roma, Carocci 2009). With Editori Laterza: Storia della camorra (2010); La questione italiana. Il Nord e il Sud dal 1860 a oggi (2013) and Napoli, Belle Epoque 1885-1915 (2015).